SPECIAL OFFER: For stays of 7 nights or more receive daily breakfast in The Ocean Front Restaurant for two adults and two children, a dedicated children's suite, complimentary round-trip Phuket airport transfers by luxury limo, a one-time Junior Master Chef Cooking Class for two children, complimentary meals for children 12 years and under when dining with parents at The Ocean Front Restaurant, professional photoshoot, two 60 minute massage treatments and a romantic dinner for two on the rocks, two times three hours of complimentary babysitting and an additional 10% off. EXCLUSIVE OFFER FOR EDGE RETREATS GUESTS ONLY: A Junior Chef Thai cooking class and also unlimited complimentary ice cream for the children for the duration of the stay. 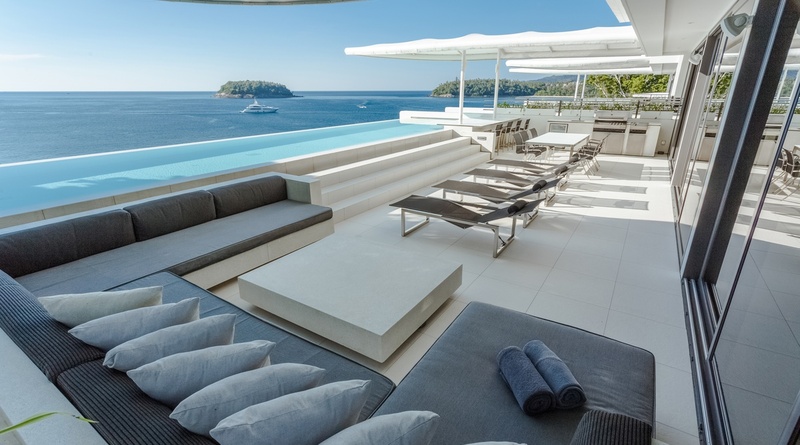 These four-bedroom Sky Villa Penthouses are the best luxury villas in Phuket each covering a massive 460 sqm spread over two floors with multiple indoor and outdoor living areas and a spacious terrace, inclusive of dining area with outdoor barbeque galley and cooking station. It also has an impressive 14-metre long infinity swimming pool with swim up bar. The master bedroom and another third bedroom (twin beds) all have unobstructed ocean views to watch stunning Phuket sunsets. There is also a fourth bedroom (twin beds) plus additional maid or butler quarters to house the hired help. All bedrooms (and maid quarters) come with modern en suite bathrooms. Sky Villa includes elegant indoor/outdoor living space with private infinity swimming pool. Sky Villa interiors are versatile and luxurious by design and equipped with top-of-the-line appliances and the latest cutting-edge technology. Sky Villas are equipped with complete European-quality ‘smart’ kitchens featuring top brand appliances. These include Siemens’ built-in intelligent sensor refrigerators, washing machines and dryers designed in Germany, Vintec’s wine cellars from Denmark and an optional Swiss-designed, automated Nespresso coffee machine. Luxuriously modern public facilities include the ocean view Restaurant and Bar at Kata Rocks that is fronted by the resort’s magnificent 35-metre infinity swimming pool. Just behind the restaurant is a library and function room ideal for classy events, exclusive weddings or executive meetings. The Infinite Luxury Spa creates exceptional, luxury spa experiences tailor made for each individual. Every session begins with personal consultation by our therapists who are trained to improvise and adjust treatments for maximum healing and guest relaxation. This extraordinary spa and wellbeing complex provides a multidimensional offering of health services, treatments and programmes supported by state-of-the-art facilities that include a radically distinctive fitness centre and gym. Most importantly, the dedicated and highly trained staff at Kata Rocks deliver a consistently high standard of service that anticipates the needs of every guest with personalised concierge-style attention that blends traditional Thai hospitality with a contemporary flair.